"Amazon’s 7-inch Kindle tablet set for November at $250"
"Apple [should] prepare for war," advises market analyst Forrester in a new report that speculates how the release of an affordable Amazon-made tablet will affect Apple's tablet market dominance. Forrester predicts that online marketplace leader Amazon will disrupt the tablet market with the launch of its iPad tablet rival, largely because the company is willing to sell hardware at a loss and recoup the costs through the sale of e-books, apps and content. "Amazon's willingness to sell hardware at a loss combined with the strength of its brand, content, cloud infrastructure, and commerce assets makes it the only credible iPad competitor in the market," adds Rotman Epps. Amazon's low-cost tablet will be successful in the consumer market says Forrester, and its success will prompt a sudden rise in made-for-Android tablet apps. Amazon also plans to offer free Prime subscriptions with the tablet. The premium service typically costs $79 a year and offers perks like free two-day shipping and access to Amazon’s Instant Video. A free Prime membership alone would net Amazon plenty of interested buyers, but at $250 the tablet seems like a downright steal (that will also ingeniously tempt owners into buying more stuff from Amazon). The tablet runs a heavily customized version of Android 2.2, and Siegler writes that it “looks nothing like the Android you’re used to seeing.” The main screen features a carousel of all your content on the device (or linked to your Amazon account), and it sounds like the interface shares little with the stock Android setup. The Kindle tablet is so deeply customized, Siegler says, that there’s no Android Market, only Amazon’s Android marketplace, and no default Android apps from Google. For the most part, this sounds like Barnes and Noble’s approach to the Nook Color, which also runs a custom version of Android with no access to standard Android applications. The big difference with Amazon’s tablet is that it will be marketed as a tablet from the start. For whatever reason, it took Barnes and Noble some time to-bring tablet-like features to the Nook Color, like games and an app store. Hardware-wise, the Kindle tablet sports a slightly rubberized rear, says Siegler. He compares it to the BlackBerry Play Book — a good sign since I’ve found that tablet to be one of the better-designed pieces of hardware on the market. "A year from now, 'Amazon' will be synonymous with 'Android' on tablets, a strong second to Apple's iPad," states Forrester boldly -- an audacious statement given Amazon has yet to officially announce its plans to build and sell an Android tablet. 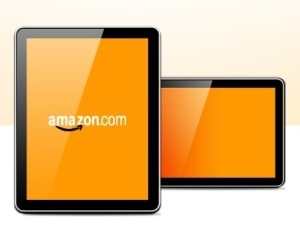 In July, The Wall Street Journal reported that Amazon was planing to release a 9-inch Android tablet by October 2011. The Wall Street Journal said, quoting "people familiar with the matter," that the tablet would be produced by an unnamed Asian manufacturer. In May technology blog BGR wrote that "[w]e received word from a tipster that Amazon, practically confirmed to be entering the tablet market in the near future, isn't planning just one device, but is planning on releasing at least two before the end of the year."